History: After his parents were murdered by Mayzak warriors while visiting the Belgian Congo, their young son grew up in the wild. Adopted by a panthers, he grew up a skilled hunter; reaching adulthood he became the chieftain of the Keeawa tribe and later other nearby tribes, and took to wearing a dark suit of panther skins (there's gratitude for you, after they spared his life and raised him!) to make him harder to spot while hunting. Eventually he was found by American anthropologist Dr. Jules Bryant, who figured out who the Panther's father was. As time passed the Panther began to travel further afield, going from Africa to Australia, America, around Europe, into the Amazon and the Andes of South America - in fact virtually the world over. His sense of justice soon caused him to start hunting criminals of all persuasions. Comments: Created by Paul Wheelahan. Thanks to Dennis Ray for invaluable additional information. 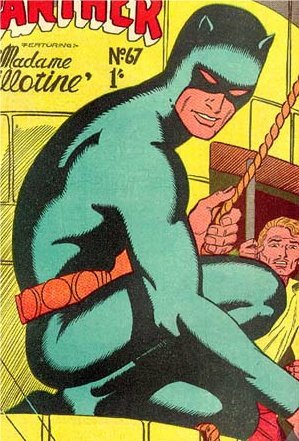 From OzComics, reproduced with permission: "A recent surprise hit has been the reprinting of a Phantom-inspired series from the 1950s, The Panther, which has been distributed primarily by Australian Newsagents. This outlet was a popular avenue for comics in the past 20 years, but the new Panther series has been the first ongoing series that have managed to succeed in a time where vmusic and video games magazines have shrunk the comics section in a big way over the last 5 years."